How to Decorate Your Garden for Halloween? Your garden is what people see at first when they pass by your home. It's important to keep a beautiful, lush garden that fits your lifestyle and taste. 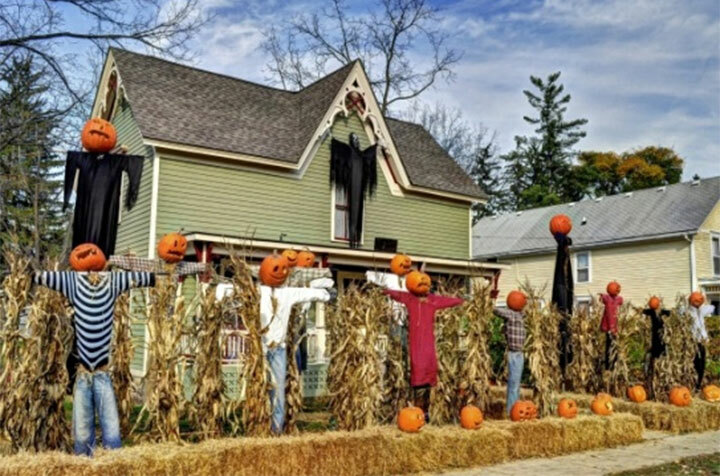 This Halloween, we invite you to spice up your yard with some SPOOKtacular Halloween decorations! Old, White Bed Sheet: We're sure you've seen this on TV or the very famous Charlie Brown's "The Great Pumpkin." If you have an old, white bed sheet lying around the house, it's time to put it to good use! Cut two holes with scissors for eyes, and you're ready to go. Throw it over a small bush in your garden and viola! You've got a home-made ghost to BOO your trick-or-treaters with. Nothing works better than the dollar store! The best decorations aren't always the most expensive and there are lots you can get at the dollar store. From window stickers to inexpensive spider webs, let your mind go wild. Set the mood with a jack o' lantern: Even if your front door has nothing else but a carved pumpkin, this is enough to set the mood. Turn the lights off and just leave the pumpkin lit with a tea-light candle. There are many other fun Halloween ideas all over the internet. Remember, anything you use this Halloween can easily be reused next year! Gonzalez Landscaping wishes you a happy and safe Halloween!